Self-ordering kiosks are becoming more prevalent in quick service restaurants (QSR) for their easy access menus that ensure prompt order processing at peak times. They increase the overall speed of service and improve the customer experience and satisfaction. Many of the major QSR players have deployed self-ordering kiosks in their stores at the table side, at the entrance, or in a line. The kiosk offers an interactive point of sale which allows customers to order, pay, and seat themselves, thereby increasing revenues through upselling and promotions, and they help increase efficiency in restaurants. Our customer is one of the leading QSR brands and also one of the early adopters of digital ordering technology. They planned to implement self-ordering kiosks in hundreds of stores. As a point of sale, a kiosk should be able to provide an intuitive interface which allows customers to order and pay securely for their food and give them the opportunity to create personalized menus without having to approach the front counter. This required a highly reliable turnkey digital signage media player solution with long life component support. Also, the kiosks should be able to enhance customer engagement and convey brand messages and product promotions. Advantech DS-081 perfectly met customer requirements with its high performance computing system, five-year warranty, ready UL agency approvals, custom BIOS, and turnkey semi-custom computing solution. Designed in a 19 mm thick, fanless case, the ultra-thin compact signage system can be easily integrated into the kiosk enclosure. The DS-081 provides a high performance computing solution using Intel Core i5 6300U processors and comes integrated with Intel® HD Graphics supporting dual display outputs in UHD/FHD resolutions for double-sided kiosks options. 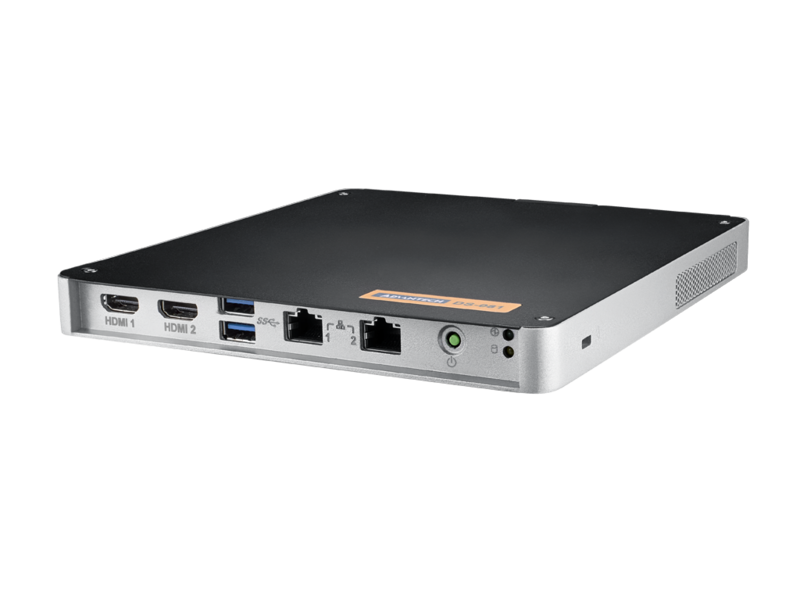 It also supports multiple connections via HDMI, USB, RS232, and audio to integrate external devices such as touchscreens, card readers, receipt printers, and more. The DS-081 features one internal Mini PCIe interface for wireless connection, so the user can create promotions, digital advertising, as well as remotely manage everything in real time. Last but not least, DS-081 is designed to be fanless and cableless, which ensures solid system reliability, easy maintenance, and quiet operation. Advantech earns customer’s trust by not only providing powerful signage solutions, but also time-to-market services and support. With a strong local engineering team, we can provide customized BIOS images for the customer’s software needs, reduce the OS footprint, and increase storage space. Advantech also provides prompt delivery of engineering samples within 5 business days of the original inquiry and ready UL approvals. As a result, the customer can focus on their application development for a faster time-to-market.